Family and Consumer Science Teachers – We have ready to use lesson plans just for you! 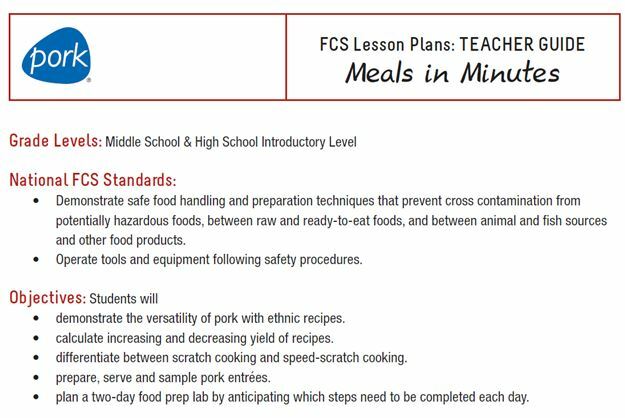 Wisconsin Pork Association teamed up with Family and Consumer Science teachers to create lesson plans that fit the National FCS Standards, Objectives, and 21st Century Skills. The plans include teacher and student files, PowerPoint slides, game simulations, lab plans, project assessments, and more! The lesson plans are created for a variety of grade levels, starting with middle school and going through to culinary arts classes. 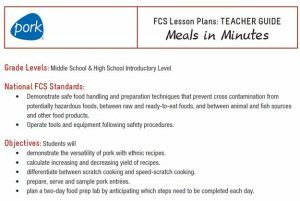 From organizing recipe steps to safe food preparation, standardizing recipes, and hands-on labs, these materials are student and teacher friendly and field tested by Wisconsin Family and Consumer Science teachers. Please enter your contact information below to access our downloadable lesson plans. Do You Teach in Wisconsin? *Note: Your answer is for information purposes only and will not affect your ability to access the lesson plans.